National Highway Authority of India (NHAI) is usually known for issuing Section 54EC bonds, but for the first time they are issuing tax free bonds as well. Now, a lot of people confuse tax savings or no TDS with tax free, but these are truly tax free bonds, which means that the interest from these bonds is tax exempt – you don’t have to pay any tax on the interest regardless of your income tax bracket. The bonds will list on the BSE and NSE, and if you sell them on the exchange and make capital gains on them, then that will be taxable. Listing of the bonds doesn’t however mean that the bonds will be issued in dematerialized form only and you will compulsorily need a demat account. NHAI bonds will be issued in both physical and demat form, so people who don’t have demat accounts can also buy these bonds. There are two series of bonds – one with a ten year maturity, and the other with a 15 year maturity. The first series has an interest rate of 8.20% and the second series has an interest rate of 8.30%, both the series will pay interest annually. Since some of the best bank interest rates are at 10% right now – you can see that for people in the 30% or 20% tax bracket – this issue has got great yield. 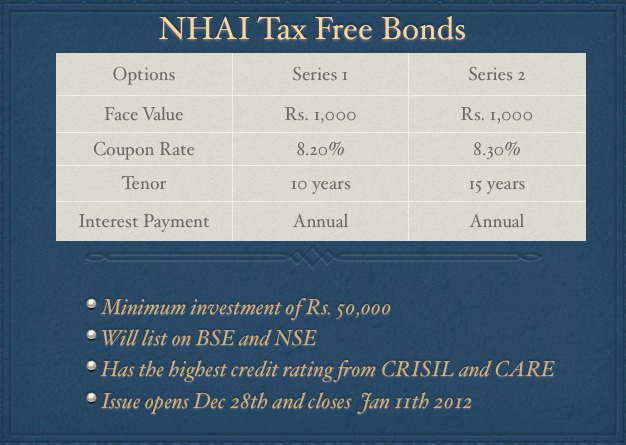 NHAI tax free bonds have been rated CRISIL AAA/Stable, CARE AAA, and Fitch AAA by CRISIL, CARE and Fitch respectively. These are very high ratings, and although NHAI has made losses in the last three years – it’s easy to see how these credit agencies assigned these bonds the highest rating. This is a secured issue from a company that comes under the Government of India, and as such it’s hard to see how NHAI could default on its debt obligation. I think this is a good issue especially for people in the 30% tax bracket, and won’t be surprised if it gets over subscribed in the first few days itself. This is especially so because interest rates can’t remain this high forever and this issue allows you to lock on to these high rates for 10 or 15 years, which is quite a good return for a safe debt instrument. And even NRIs can invest in these bonds, so to the extent they can manage the application process, this will be an attractive offer for them as well. SBI CapitalÂ Markets, AK Capital Services, MCS Limited, ICICI Securities and Kotak Mahindra Capital are the lead managers to the issue so you should find the application forms in their offices. Other investment firms like Karvy should also have the application forms, and I think some of these companies will also enable it so that you can apply for the NHAI tax free bonds online, but I don’t have a definite list yet. I’m sure as more information comes in – you will leave comments and I’ll update the post with where exactly you can find the application forms etc. at the time. Meanwhile, many thanks to Rakesh Jain who let me know about this issue much in advance, and let’s hear any other questions or observations you have about the NHAI issue in the comments. Update: Deleted the part about allotment being on a first come first serve basis per Shiv’s comment below. I have applied for 500 capital gain tax exemption bonds of National Highway Authority vide application no.200795 DT.29/8/2015. When I get bond certificates physically.